TOMS RIVER, N.J. -- Police in Toms River, New Jersey say a man driving while intoxicated was arrested after crashing in a traffic backlog that was caused by his own earlier DWI crash. Investigators say it all began around 9:50 p.m. on Tuesday after 19-year-old Nicholas Corsair crashed an Infiniti G23 into a utility pole on Route 9 near Whitty Road. 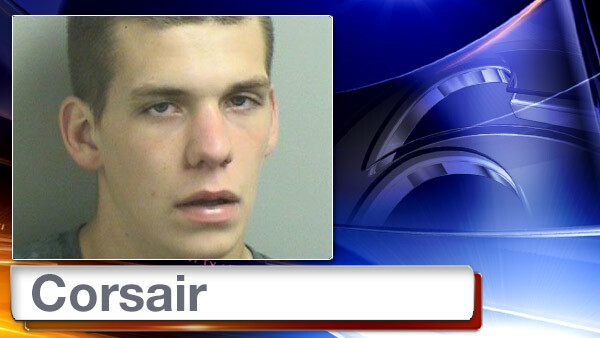 Police say Corsair was arrested and then released at 3 a.m. Wednesday. Then, at 7:30 a.m. Wednesday, police say Corsair was again DWI in the area amid heavy traffic congestion caused by a road closure to repair the utility pole damaged in the earlier crash. Police say Corsair crashed his pickup truck into the back of a Honda Civic, then fled the scene. He was located at his home and arrested at 8 a.m. In addition to his arrest, police arrested his mother, 51-year-old Jacquelin Lotronico, for allegedly allowing her son to drive while under the influence of drugs before the Wednesday morning crash. Police also note that 23-year-old Robert Latronico, who was a passenger in the Infiniti that crashed on Tuesday night, was arrested at the scene on multiple outstanding warrants.